Just finished this little bear with my new yearn. It has a bit golden brown fur mixed with shiny threads. I really like the effect under camera. 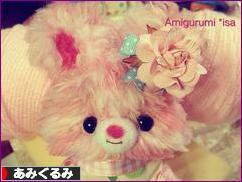 Oh, btw, please support me by clicking the link to boost my amigurumi page ranking in Japan! I’m still experimenting different material and get familiar with the size. I wanted to make some 6 inches plush and some 4 inches. I think this little puppy is about 4 ~ 5 inches. 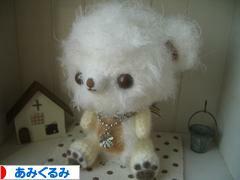 This little bear is on my Ami catalog, if you are interested to get one please let me know. Price is $15.00, shipping is $3.75 for U.S. Domestic, $5.00 International. I want to find these baby curly alpaca/alpacassos good homes! ^^ These are SO cute! It’s different from the normal alpacas that we got, their fur are little bit curly. All of them are with nice polka dot bow and pearl necklace! Sophisticated and cute! If you are looking for unique Valentine gift, this will be PERFECT for you. Or, if you are a Mad Alpaca collectors, this will be a nice addition to your collection! These are So cute ^^ They are about 10cm, very nice to hang on your purse or even cell phone. Side shot for you to see it. You can use this bag for almost everything. Carry around while you are shopping in the mall, for wallet, phone and digital camera. I use it to put all my little things like lip gloss, coin purse, digital camera..etc THEN I put this inside of my bigger purse. I also take this out when I go out, it’s light and very easy to carry. I only got 1 at this time and if you’re interested please let me know. Shipping & Handling are the same as Alpacas. I am planning to make it more and to finish this weekend so I can get ready for my shops. People! puppies are looking for good homes ^^ These are going very fast, so adopt one now! Since I participated page ranking site in Japan…I ALWAYS want to write something in Japanese, yeah Ha! I don’t know how to write Japanese and too shameful to ask my good friend Nana to translate for me. I think she’s busy till April. =_= SO, forgive my “alternative” good friend “Google’s” lousy translation skills. IF you don’t understand a single word from my post, it’s TOTALLY OKAY, because when I translate back to English I didn’t understand what I was saying in Japanese. Haha! It’s not too big…as you can see it’s about a bit smaller than the palm of your hand 🙂 Have you noticed something? All the pictures are BACKWARDS! arrrrrhhhhhhh! I am way TOO lazy to correct it now ( it’s almost 2 am) I need my sleep to save my skin -_- Well, hopefully I will be more careful next time. Ha! Hi Guys, I got some email asking me to post pictures on the blog so it can be downloadable. Okie, here are the newest banners that I made for you! School Alpacas…they are in Art class! Have a great Monday, stay healthy, stay warm and be happy <3 <3 Mao Mao loves you. I was amazed that I could finish a puppy amigurumi faster than I thought! When I first started I took like several days to finish a head (with no eyes whatsoever). But now, I can finish faster, I think I’m making progress here! I’m So excited, hahah yes because it is 2012! I made few promises to myself, uhm, sorta new year resolution and I hope I can keep it till the end of this year! What’s your new year resolution? No matter what they are I hope you all have a wonderful start and healthy 2012! Ok, I started crochet my Number 1 bunny BUT BUT -_- I didn’t like the yarn that I bought from online. It felt soft, it looked soft but it is SUPER HARD to crochet! Unlike 天使のファー, super soft fluffy and easy to crochet. Here is the first try out for Bunny No1, I really don’t like how it turned out…ARRRRHHH! Have to redo again tomorrow! Sorry that my phone didn’t transfer the picture *sigh* I’ll post more new pictures tomorrow night then. Hopefully tomorrow I’ll make better bunny -___-. Thank you for your support and patient, I shall work harder to get this thing done ASAP -__- Have a great Wednesday guys, please take care and stay healthy. For those of you are waiting to purchase Alpacasso plush now is your chance! Batch #4 Pre-Order will be open on Jan 1st. till Jan 30th. Items are scheduled to be released in Mid Jan & Mid Feb. So make sure that you don’t miss out the release date. Thank you for viewing my blog have a great day! I finally finished Angry Bird’s friend; Angry Pig Amigurumi cell phone charm! I’m SO happy that I was able to finish it before my Birthday dinner. Since my plan was to have a nice dinner first, then all go back to my place and open Christmas gifts for my sister’s kids so we don’t have to bring it to Vermont with us. I also prepared small gifts for each and everyone in the family…I wrote them cards and thanking them for what they have done for me. I am really blessed to have my family besides me. Since I don’t have family of my own, I really appreciate that I have family live near me and keeping me company. I made this amigurumi cell phone charms for my brother and my sister-in-law. I asked them before if they like the pig character in Angry Bird, they said “yes!” So I thought it will be PERFECT little gift for them. In reality, they don’t need anything and it’s HARD to buy gift for them ;P I thought this will be cute and different. ^^ So far, I did not see anything like it selling on anywhere! I really liked the finished products and I am SO proud of myself; able to make such cute things and OMG the packaging ^^ I feel like I’m getting better on decoration and color choices…hahaha. Still, my dear friend Anni, she’s the BEST! I really admire her craftmanship, everything she made turned out SO pretty! Every time I make something I thought about her, she’s an amazing artist! Hello~~ It’s a couple of Angry pigs? Hello~ You have me with you! I just started to work on my Christmas gift that I promised a month ago >_< It’s for my brother and my sister-in-law. Okie, here is the Working-in-progress ami pig! Such a nice green color, very crispy and vibrant green! Sorry about the picture, I couldn’t make it turn clockwise…. Ok, this IS the pig that I’m going to make, it shouldn’t be that hard, except I need to use other material such as felt fabric to accomplish other parts. 🙂 I should (insist myself) to finish these pigs tomorrow night! Once I finished I’ll post it in here! 🙂 Thank you all reading my post, happy weekend everyone! Here are several picture sliders that I made few hours ago. I hope you liked my models and the way I edit. Let me know which style you like the best, I’ll try to make a wallpaper for you guys to download as freebie, OK? Love that phrase? xD haha, I was thinking about how can I express with few simple word about this picture. It’s red, it’s about love…Ta-da! A phrase was borne! I’m itchy to try other color like rose pink and maybe light purple? O__O I saw other people using flowers but since I do not have the knowledge or help to get these kind of information…I guess I just stay with my golden retriever color then…he he he. Just got my new yarns today and couldn’t wait to test it ^^ I used red tea to dye… I was excited when I saw some of the blog talking about dying their yarns using different ingredient and I wanted to try it out. The color that I really like is “Golden Retriever ” color! Ha ha ha, it is true! I really like the light golden tone…it will be SO pretty to take that color and make a bear! First testing…it came out pretty dark. Well, darker than I expected 🙁 But my Mom and sister all said it’s a beautiful color…what do you think? Thank you for viewing my blog~~ Have a great Wednesday guys.